You definitely deserve to be with someone who is going to take one look at you and know that you are everything they could ever want. They should see you for who you are and tell you that you are always going to be more than enough for them. You need to be with someone who wouldn’t allow you to ever doubt your sense of self-worth; someone who doesn’t seek to take away from who you really are. 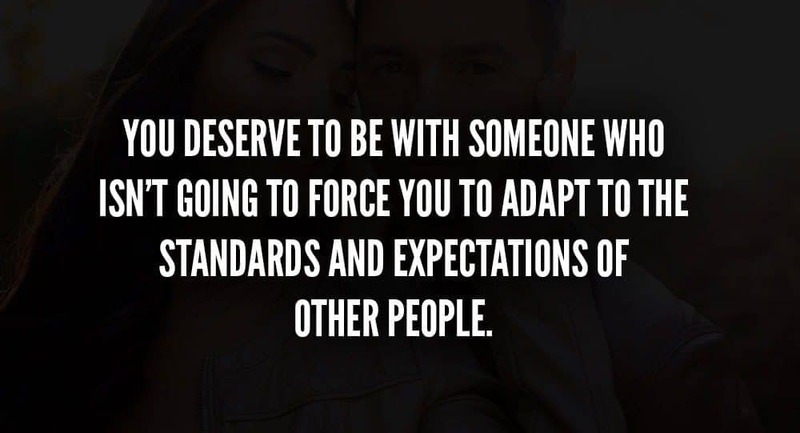 You deserve to be with someone who isn’t going to force you to adapt to the standards and expectations of other people. They should be able to see the value in who you are on the inside and that should be enough for them. They shouldn’t compel you to just completely change your entire philosophy in life just because it’s what they think other people want out of you. You deserve to be with someone who isn’t going to force you to actually prove your worth. You don’t have to be with someone who is just going to tell you that you’re being too much or too little of something. This person should openly embrace who you are and everything that comes along with it. You deserve to be with someone who doesn’t compel you to actually be this unreasonable version of yourself who only exists in dreams and fantasies. This person should love and accept all of the mannerisms that come with your personality. They should be appreciative of the way that you talk and the way you conduct yourself. They should always be willing to embrace the many eccentricities and unique traits that make you who you are; the traits that really define you as a whole. You deserve to be with someone who is going to love all the bad parts just as much as they love the good parts. They can’t expect you to be perfect all of the time and they shouldn’t want you to be. Because being perfect would mean you not being who you really are – a flawed but beautiful individual. You deserve to be with someone who isn’t going to read too much into your flaws and blemishes. This should be someone who understands just how difficult it is for you to deal with your many insecurities and anxieties every day. And instead of feeding into these things, they should be helping convince you of your worth. You deserve to be with someone who is going to see beauty in you even when you don’t necessarily see beauty in yourself. You have to be with someone who is going to see you in the morning before you get ready and still think that you are the most beautiful creature on earth. You could put all of your imperfections on display and they still wouldn’t be convinced that you’re not beautiful. You deserve to be with someone who finds you attractive even when you’re at your absolute worst. You are going to have a few stormy days here and there as you make your way through life. And you deserve to be with someone who is going to serve as a source of strength and light in these tumultuous times. You deserve to be with someone who is going to make a conscious effort to really be there for you and reassure you that you will never be alone no matter what. You deserve to be with someone who is genuinely proud of the person that you are. You deserve someone who isn’t afraid of putting all of your talents and skills on display. You deserve to be with someone who pushes you to actually go after all of your goals. You deserve to be with someone who makes you believe that it’s okay to pursue your passions in life. You deserve to be with someone who is going to love you just as much on your worst days than on your good days. You need to be with someone who is going to stay at your side during the most difficult moments of your life. You need someone who is going to embrace you for everything that you are and not just the parts that are most convenient to them. You deserve to be with someone who still thinks that you are smart even when you don’t make any sense. You deserve someone who is always going to want to listen to whatever you might have to say because they truly value your thoughts and perspectives on things. You deserve to be with someone who will love you the way that you truly deserve to be loved – wholeheartedly and unconditionally. You deserve someone who is always going to love you even when circumstances change. You deserve to be with someone whose love for you is transcendent.